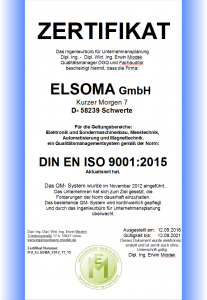 ELSOMA GmbH was founded in 1989 in order to develop and market magnetizing devices. The focus was on small portable units with integrated magnetizing coil and measuring possibilities of magnetic and electrical parameters. In the following years, the product range was continually expanded to include fully automatic magnetizing devices, which are suitable for integration into automation cells. In addition, the field of activity has been extended to magnetic measuring technology (for example, flux density measuring devices). In 1997, automated manufacturing systems were added which were able to magnetize technically complex magnets in large numbers and with a high production cycle and to transfer them to automation cells for further processing. The focus was initially on the magnetization of AlNiCo and hard ferrite magnets, which were used, for example, in sensor systems and are usually magnetized only after complete assembly. Since 2004, the development of magnetizers and magnetizing devices for plastic-bonded magnets and magnet systems has also been part of the ELSOMA GmbH product portfolio. With these also the highly coercive materials, e.g. SmCo, were taken into account. The design and manufacture of multi-pole magnetizing devices for multipole magnets has become an important field of activity here.